notnowjez: @jayrayner1 loved that, a friend went last week and described it as the real life online kids sensation habbo hotel restaurant. manlyartichokes: @jayrayner1 is it not disingenuous to complain about a resto ‘trying too hard’? Would you prefer they didn’t try enough? winewchristina: @jayrayner1 I feel it Jay. A completely underwhelming meal for me last night too..
edibleornamenta: RT @jayrayner1 Dinner. Birmingham. Feel my pain.http://bit.ly/gq3f5q (expand) / oh dear. Glad I don’t own this place. PRBloke: @marvovox @jayrayner1 I ate at Opus recently. It’s not a ‘destination’, but brilliant for business. Allows you to get the job done nicely! HERMANOPRIMERO: @Mcmoop @jayrayner1 I don’t mind places trying too hard – better than not trying at all. And there’s a lot of *that* around. the_bald_man: @jayrayner1 Couldn’t agree more about Opus, the most over priced experience ever. Give me Simpsons any day. HardensBites: @jayrayner1 Think your tweet is a bit unfair to Brum – city which has become surprisingly strong at top end (only) in recent years. Debbiegreeneyes: @jayrayner1 oh gawd! Off to B’ham for culinary delights later this year. Fortunately to Purnell’s! NathalieFindlay: @jayrayner1 They’ll have to rename it ‘Oups’! It’s hard to disagree with the substance of Jay’s review – the menu at Opus does play it safe. Dishes can come a little underseasoned and flavour pairings can be uninspired. The quality of the meat is not always as good as the advertised provenance suggests. The room is huge and uncomfortable, and usually fairly empty which gives it a soulless quality. And it is expensive, very hard to get out for under £100 for 2. But, but, BUT! The sad thing is that Opus is actually one of the better Birmingham “mid-range” options – which are usually dire. Despite the above caveats we’ve eaten there at least 7 times in 4 years. The first part of the review about women owners feels like a non-seqitur, I’ve not noticed a strong feminine presence at Opus and the head chef is a man – David Colcombe. David does take time to put on themed events, highlights suppliers, and offers a market menu with slightly more interesting options than trad beef or fish. I wonder if menu choices reflect the business clientele that must keep this place afloat. Sigh, Birmingham, what are we to do with you. We’re brilliantly catered for at the top end (Turners, Purnells, Simpsons, Loves, Edmunds) and there are also decent cheap eats options, usually Indian (Jyoti’s being my absolute favourite). But in the mid-range the options are dire: I’d rather stab my eyes out before going back to places like Bank, Piccolino or Cielo. And that just leaves the chains: Jamie’s Italian (poor), Cafe Rouge (best restaurant in Brum according to the Retail Birmingham Awards http://www.stylebirmingham.com/awards/), and all the others that I can’t be bothered to even name. I would have much preferred to read a skewering of Bank – for instance – than Opus, which genuinely is “not trying hard enough”. However, I think after the initial shock for the Opus owners (man and woman) wears off, I know they will resolve to pull their socks up a little and continue to improve their offering. The weather was bitter again this week so what better than a warming bowl of Vietnamese pho (pronounced fur) after work? 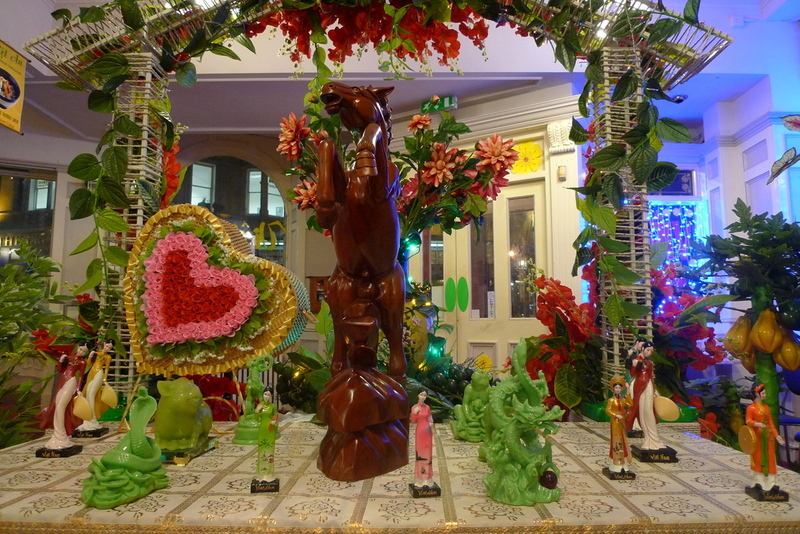 Viet An has been open 2 months, and cleverly, has built an early customer base with an initial offering via Groupon. For some reason I only tend to get sent offers for waxing and day spas on Groupon and I didn’t spot this offer. Viet An has taken the place of a huge old pub opposite the magistrates court in this seldom-visited part of Birmingham (for me), near the children’s hospital. Brightly coloured signs welcome you in, and the effect inside is psychadelic. The room has been cheaply decorated but has great charm. 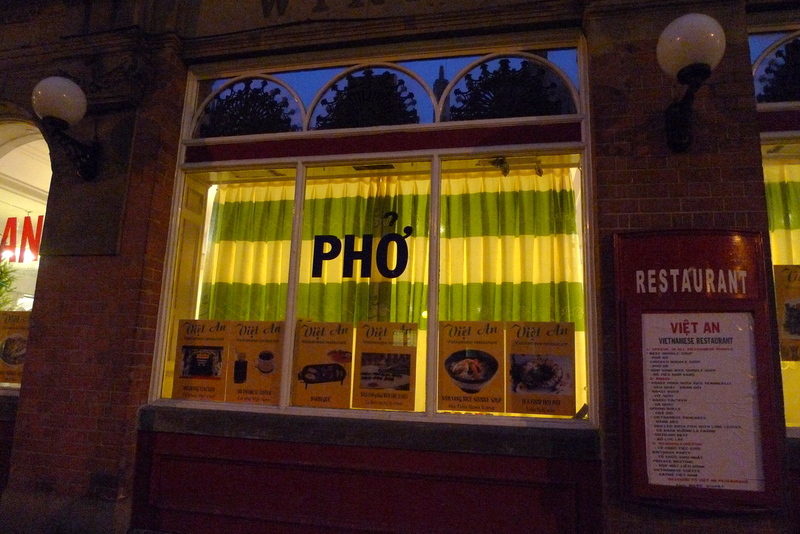 You are given a very warm welcome – proceeedings are run by a lovely Vietnamese grandmother, who speaks little English but bounds over to tell you how each dish should be eaten. 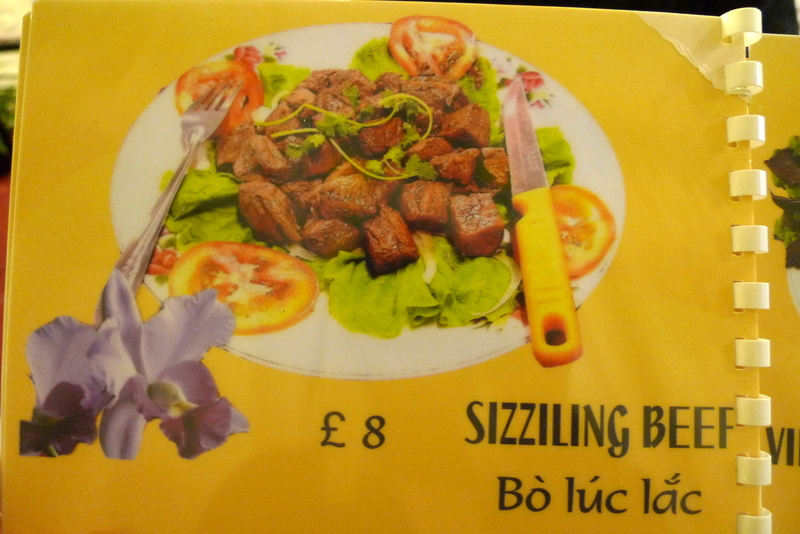 In fact the effect is so charming that I would be hard pressed to slag Viet An off even if the food was terrible. Luckily it was pretty good. The menu is minimalist, usually a good sign, and kitschly illustrated. The usual Vietnamese staples are there, minus Banh Mi, a slight disappointment. We fairly ordered the entire menu. Beer is a carry-over from the previous pub, being mainly crap brands on tap – hopefully they will import some Vietnamese beer soon. 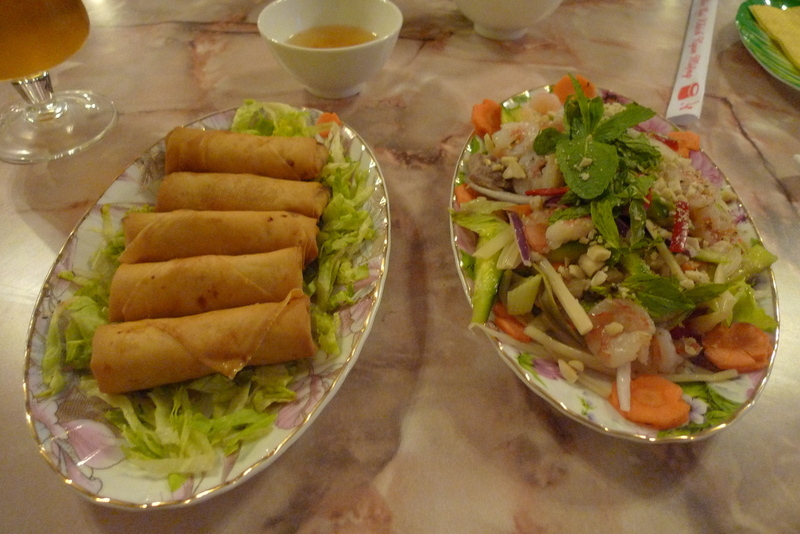 Starters of Vietnamese spring rolls were great – crisply fried batter with a decent amount of pork filling. Lotus salad had authentic flavouring with decent hits of mint, lime, fish sauce, chilli, garlic and peanut coming through. 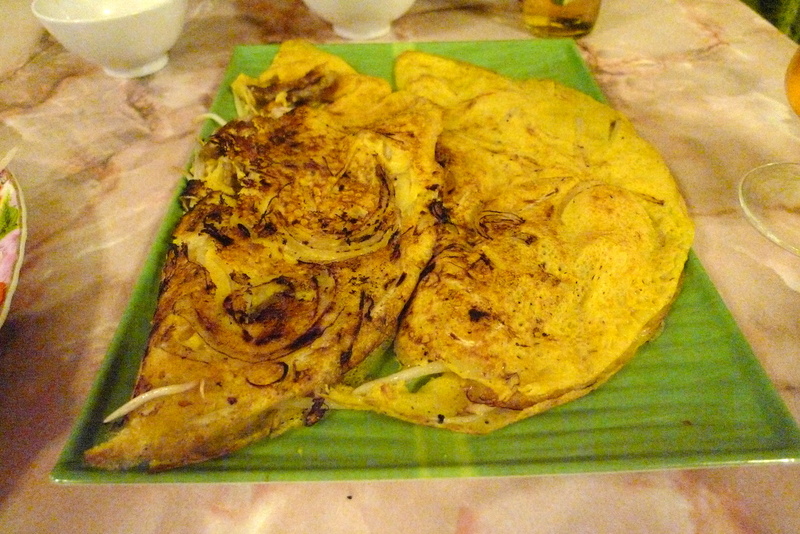 The third dish of Banh Xeo was my favourite – the silky pancake batter could have been mistaken for an omelette. Slightly underseasoned, when added to the dipping sauce this was perfection. 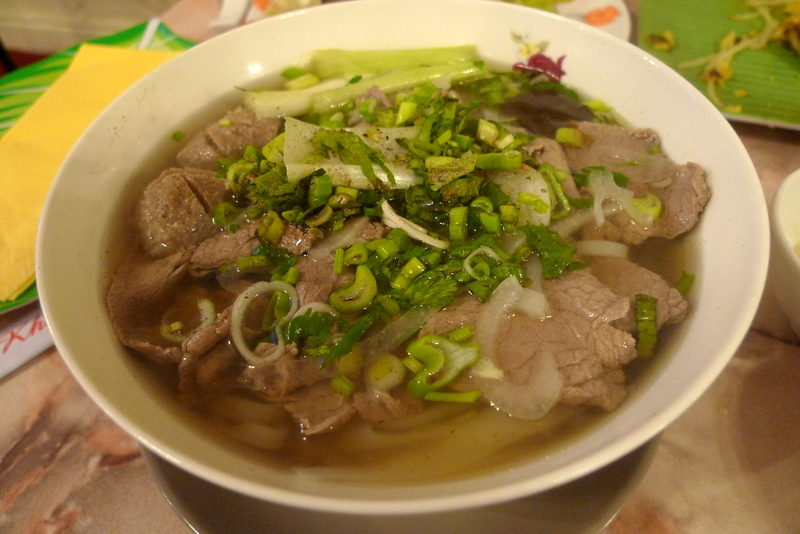 Just as we were getting full, the signature dish of pho bo arrived, a huge bowl with a decent amount of beef in it, as well as some little balls which were probably unmentionables. 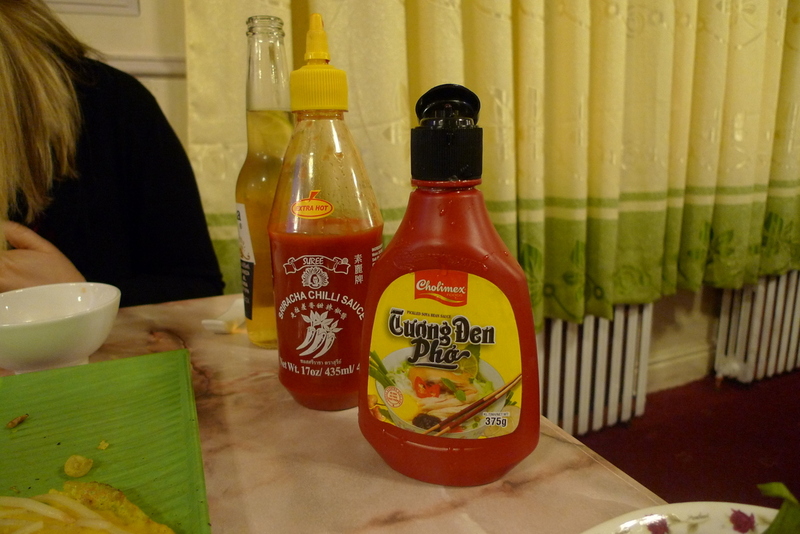 Chilli sauce and tuong (bean sauce) was supplied to pep it up a bit. A small plate of garnishes including some Thai basil could be added. 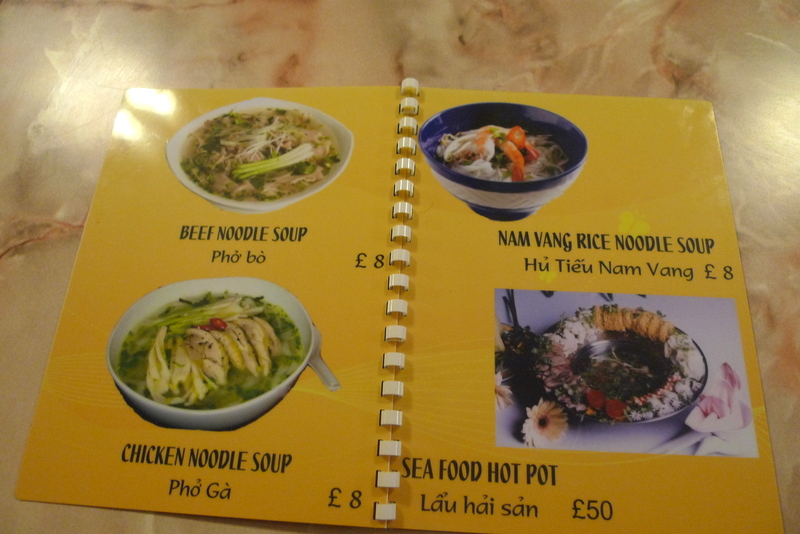 I could pick plenty of holes in Viet An if I was inclined – the pho stock wasn’t meaty enough, ideally it would be thick with gelatin from big old beef bones. The lettuce and carrot garnishes looked a little bit sad. The ingredients could be of better quality, and more Vietnamese herbs wouldn’t go amiss. 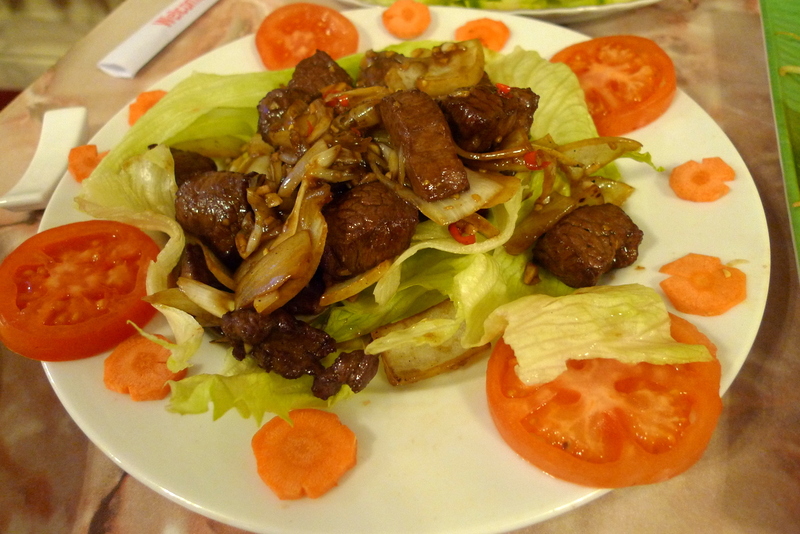 But Viet An is charming and authentic and also very cheap. Places like this should be encouraged. Oh, and one final word of warning – it was absolutely freezing in the dining room so either go on a warm day or keep your jacket on! Half-sours: Quite honestly I was near to giving up on the possibility of doing our own pickles for Popstrami. Previous attempts had not gone well, and I’d put that down to the rather sad, floppy cucumber specimens I had found in ethnic supermarkets. Clearly cucumbers are not in season right now and they don’t take well to sitting around. Salvation has come in the unlikeliest of places – Costco. I’ve never been to this gigantic food wholesaler/cash and carry before (and perhaps won’t again) but it really is quite impressive, even if you don’t much like the idea. Cut a long story short, they had pickling cucumbers and they were impressively firm. When I got them home I was relieved to find they weren’t bitter either, so I have high hopes of getting some decent half-sours out of them. There are various recipes for pickles – the idea here is that they ferment in a cool but not cold environment until you are happy with the taste, and then they go in the fridge to store. I’m using a variation on this recipe – approximately a 4% brine, but I have omitted the bay leaves as I find these are such a dominating flavour (particularly as my bay tree produces huge, flavoursome leaves). I like my pickles to taste mainly of dill and garlic. Michael Ruhlman also has a couple of useful blog posts here and here. I’m a beginner here so I don’t have much more to add. Oh, except to say I like to add more fresh dill to the brine as the process of boiling the brine tends to turn that to a rather dull green colour. Well, if you want to know how they turned out, turn up next Sunday 13th! It’s been a troubling few days behind the scenes at Popstrami as we realised that our intended venue wasn’t going to be nearly big enough to satisfy the apparently huge pent-up demand for massive meat sandwiches in the West Midlands area. Luckily, the legend that is Paul Leverton has come to the rescue and offered us the use of Leverton and Halls’ deli for the whole of Sunday 13th March. So, that’s Leverton and Halls on Sunday 13th March 11:30 – 18:00. Not Saturday! We’re opening earlier to satisfy those meat-brunch cravings, and the increased space means we might even put a few new bonus items on the menu. Leverton and Halls is in Bournville, very near to the previous location, and a short walk to Bournville Railway Station (3 stops from New Street). If you are not available on the Sunday and were planning to come on Saturday, we’re sorry and hope you can forgive us. If the date change means you can come now, that’s great! In other news – we’ve also expanded the Popstrami team – we’re very pleased to have the help of Lap-Fei Lee who is on authentic NYC cheesecake duty and ‘Evil’ Gordon who will be helping man the good ship Popstrami and cooking up a few Bournville babkas! And finally should say a massive thank you to the team at INHABIT who offered us the use of the pop-up tearoom in the first place and kick-started this mad venture. So, see you on the 13th! Keep an eye out for updates here.